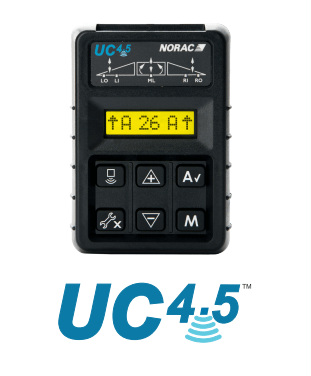 The UC4.5 features non-contact sensing and individual boom overrides. With non-contact sensing, the Spray Height Control System never comes in contact with the ground because all sensing is done through ultrasonic sensors. Additionally, when necessary, you can place one boom section into manual override. This is important when you have a fence on one side and clear terrain on the other. While you worry about the fence, the other boom sections can stay in automatic mode. 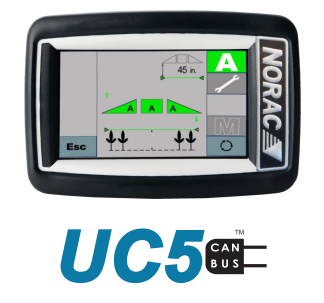 The UC5 is ISOBUS certified, and it can be operated through any universal terminal. It is easy to operate and it offers help and support from our experts through troubleshooting. It offers ultrasonic sensors to monitor field terrain so that you can most effectively spray. Additionally, it features Hybrid Mode technology which uses sensors to simultaneously track the crop canopy and soil surface to keep a consistent spray height. The UC7 is the newest model, with an all-in-one boom height control system that can be changed to any level of automated control, including standard control, passive roll, active roll, and active wing roll. Standard control is a basic, budget-minded height control solution for smaller booms and is best with mild, flat terrain. Passive roll is the most popular solution for challenging terrain. Active roll is the premier control for inconsistent and challenging terrain. Active Wing Roll is the premier wing control system which hydraulically links to the wings to simulate roll without moving the center. This maintains the ideal height consistently, and provides for the best spraying experience. 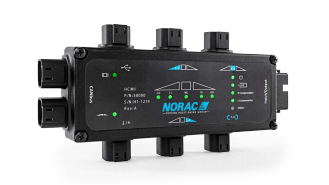 Contact West Enterprises for more information about Norac products.